1 Who’s idea was it for you to work together? Hughes’s. He saw a glint, shadows and reflection off a pound shop and realised there was beauty in there. The light on an ironing board, other banal objects he’d been photographing too. He told Davis about it and he agreed – he’d seen this kind of thing himself and felt the same. We all see these things. He went on to mention the bits of paint and scrawls that can obliterate but have an inherent beauty. Hughes grimaced at Davis’s use of the word ‘palimpsest’. They went for a drink and realised that they had a similar eye in these matters. They jabbed and parried with good humour and decided to make some work about it. They thought up ways of replicating – or even celebrating – that never to be repeated moment. One idea would lead to another and some sense of excitement grew. Sculpture was considered. 2 How easy was it to work together on an exhibition? 3 Can you explain the process you went through to create the works and some insights into why. Pound shops are a symbol to many things: poverty, usefulness, mandatory supplies, drudgery, cheapness, disappointment, comedy (“How much is that?”). They’re everywhere, sometimes next door to one another. Most people have bought things in them. They are frowned upon by some. Also Hughes had some photographs of a brick on a radiator and the aforementioned ironing board. 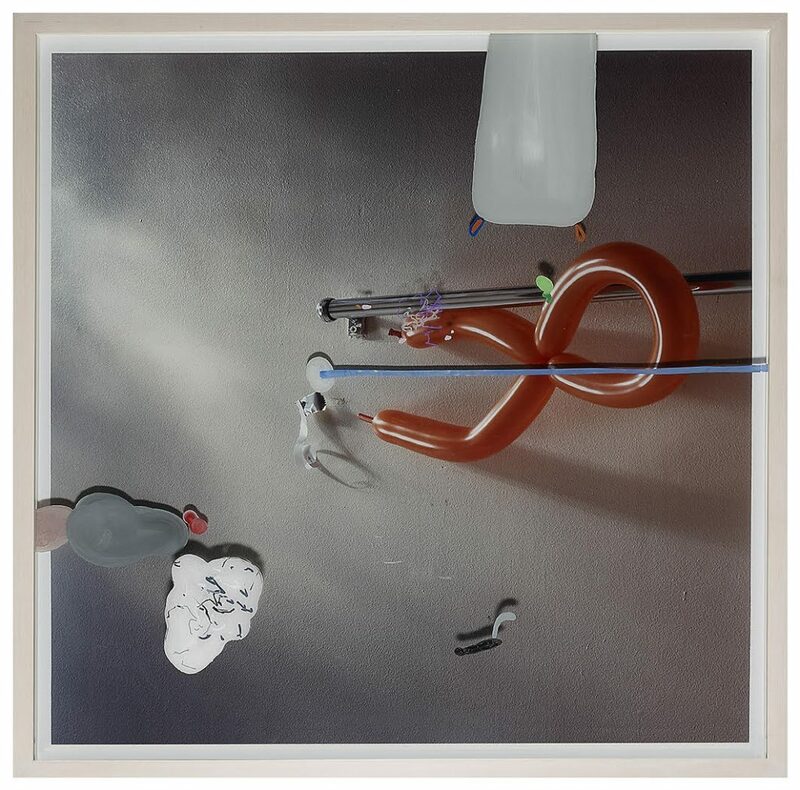 Davis started experimenting painting and drawing on acetate and perspex to lay over the top, the marks casting shadows of their own and reflecting with the surface of the print. The two bought cheap stuff, constructed still-lifes photographed them and then painted on the back of two sheets of glass which sit in front of the C-type print, completing the framed piece. 4 Do you need to do stuff to everyday objects to make them beautiful? Depends how you present them. In this case it depends on the lighting. 5 Why is the exhibition called ‘Give me strength” ? They couldn’t think of a title. The few they came up with were awful. The title came from that process. 6 Do you plan to work together on future projects?